Mateo had snagged a total of five baseballs in his life, including a batting practice homer that he caught on the fly, so although he was inexperienced as a ballhawk, it was clear that he had some skills. It turned out that his main problem — the main thing that was preventing him from putting up big numbers — was his hesitance to call out to the players. 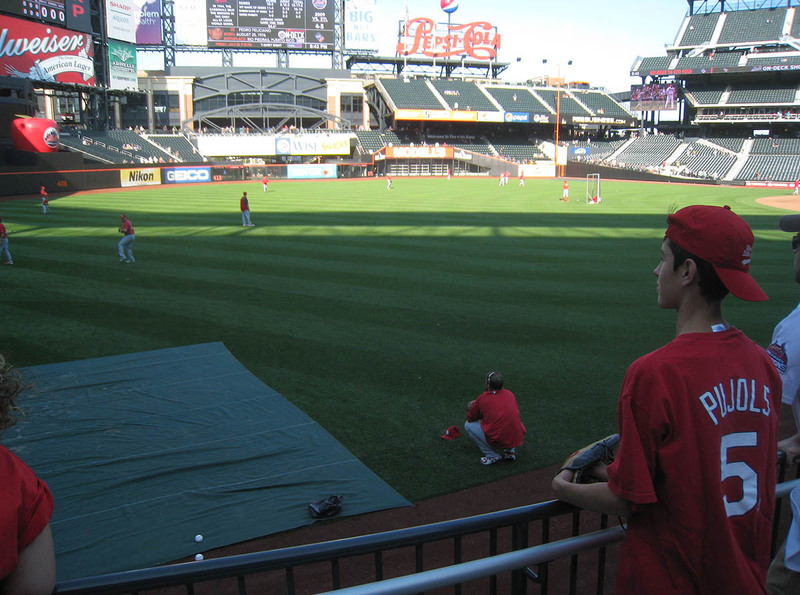 Therefore, after I got a quick ball from Henry Blanco in left-center field, I turned all my attention toward him. If you look closely at the photo above, you can see a long, narrow sign on the facade of the upper deck on the 3rd base side that says, “NOW BATTING – #5 DAVID WRIGHT.” Pretty cool, huh? Although I’m sure it’s been done before, this is the first time (outside of the 2007 Home Run Derby) that I’ve ever seen a stadium display the name of the batter in the cage. …and as a result: nothing. 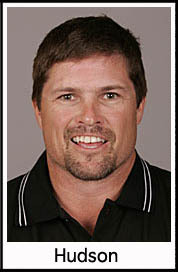 It was one of the toughest batting practices ever, and my other ballhawk friends agreed. Greg Barasch was there. 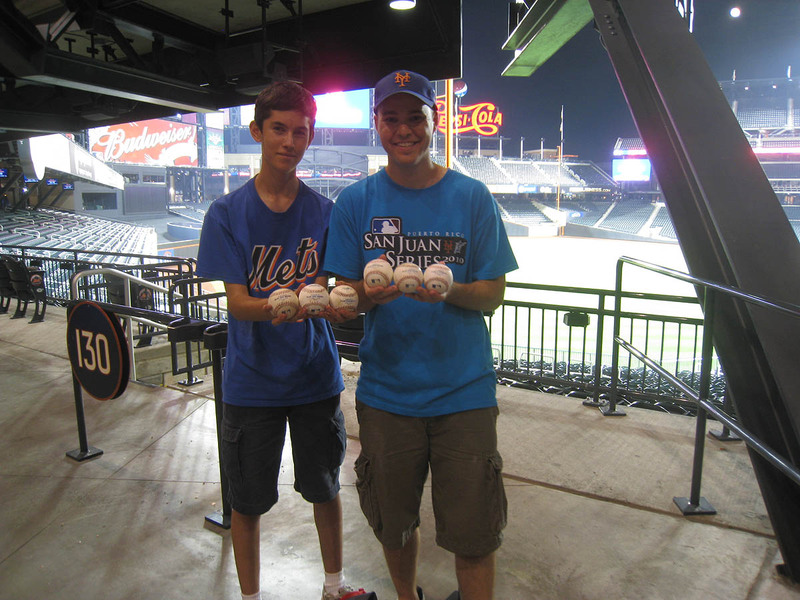 He often breaks double digits at Citi Field, and yet he only managed to snag ONE ball before the game started. Joe Faraguna was there. So was Gary Kowal and Clif Eddens. All these guys regularly snag half a dozen balls per game, but on this difficult day, no one finished BP with more than three. 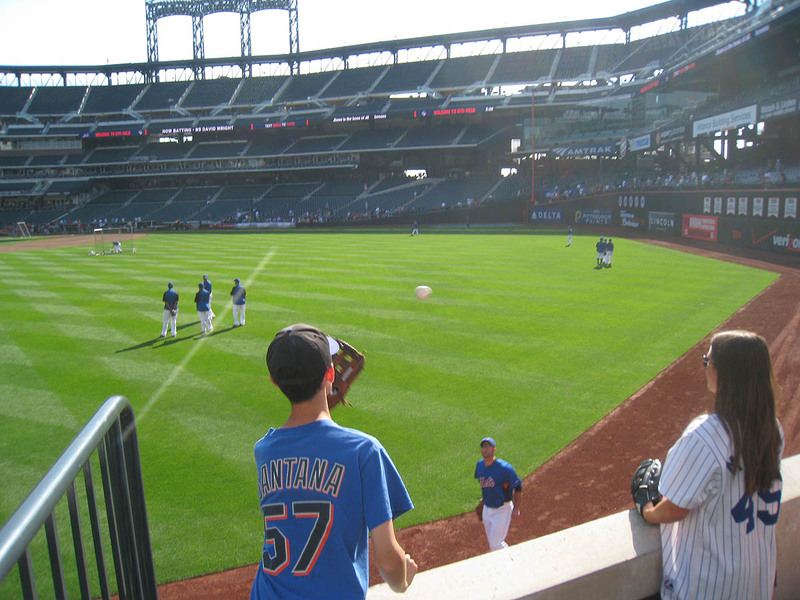 Toward the end of BP, I got Dennys Reyes to toss me a ball in left-center field. 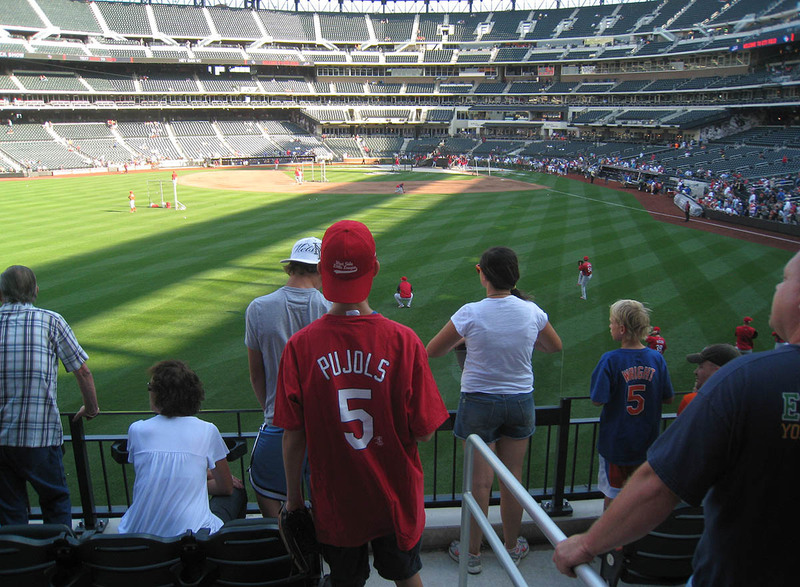 I gave that one to Mateo, and then I caught a Ryan Ludwick homer on the fly in straight-away left. 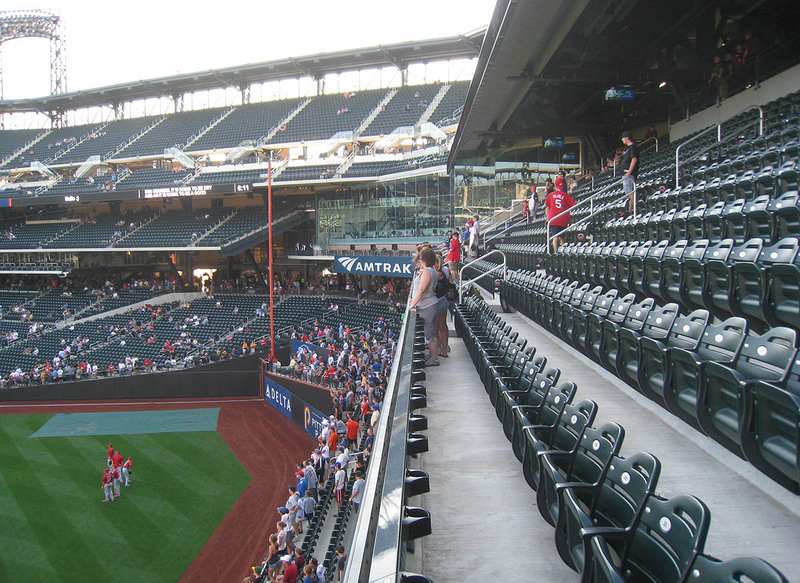 Mateo was near me on that one, but it was really crowded, and he was blocked by a railing. The Ludwick home run ball had one of the biggest grass stains I’ve ever seen, and you’ll see a pic of it at the end of this entry. 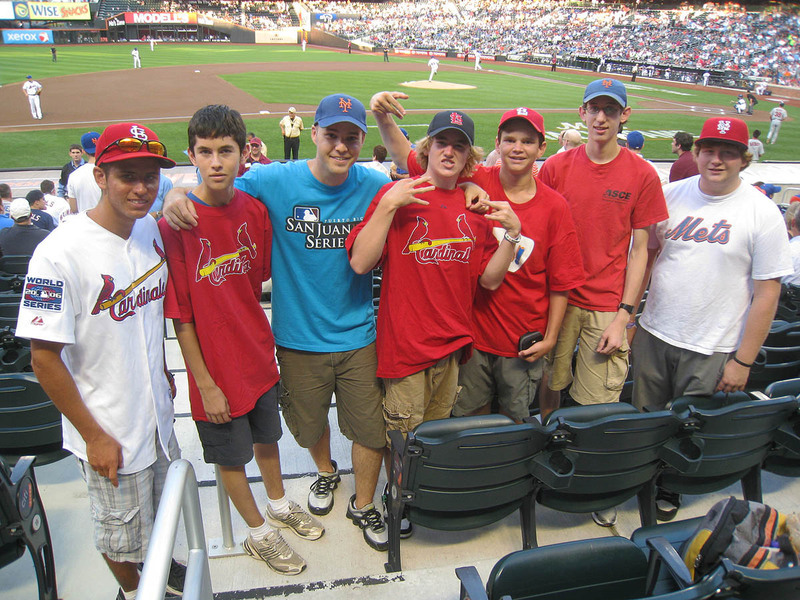 In the photo above, from left to right, you’re looking at: Dan, Mateo, me, Clif, Joe, Greg, and Gary. Whenever there were two outs, he inched toward the front. I stayed back and watched his backpack and had my camera ready to get an action shot, but…nothing. He came really close to a few balls, but like I said before, this was just one of those days. He wasn’t getting the breaks. As for the game itself, the outcome was shocking. Cardinals starter Adam Wainwright entered with the second most wins (14) and the second lowest ERA (1.94) in the majors. How did he do, you ask? He surrendered a season-high six runs in five innings, and the light-hitting Mets won, 8-2. After the game, Mateo and I attempted to get a ball from home-plate umpire Marvin Hudson. I had offered to help him get one — to shout at Hudson on his behalf and then stand back and let him catch it — but he wanted to try to get one on his own. Unfortunately, I ended up getting a ball from Hudson and Mateo didn’t. We then hurried over to the dugout to try to get a ball from the Cardinals relievers as they walked in from the bullpen. That didn’t work out, but two minutes later, when all the players and coaches were gone, a ballboy stuck his head out of the dugout and threw me a ball. It was totally unexpected. I wasn’t even wearing my glove, and just like that, my total for the day had jumped from three to five. 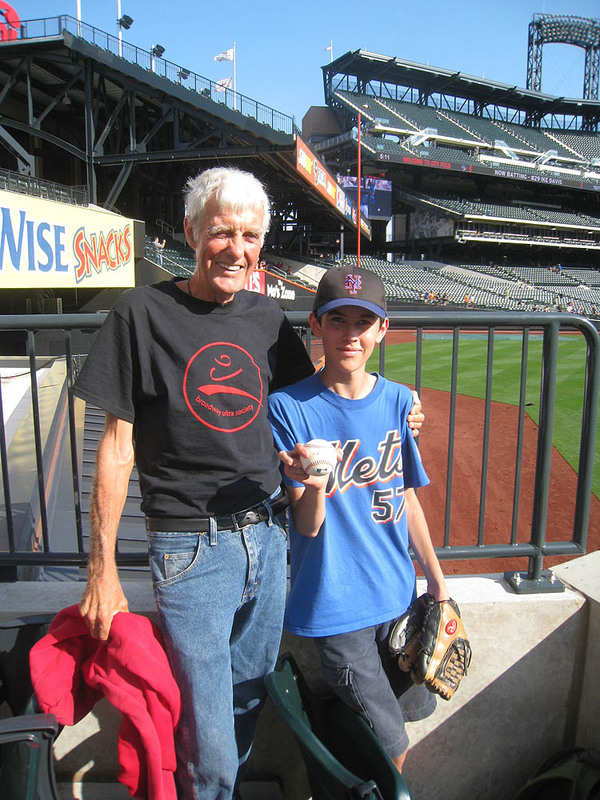 Before we said our goodbyes, his father told me that they have a copy of my second book, Watching Baseball Smarter, and that he loves how it was written. He said that between the book and everything I’d taught them about snagging, I’d made baseball more enjoyable for them — that I helped show them a new dimension of the game. He thanked me for that, and I thanked him for the kind words. It was truly one of the best compliments I’d ever received. • 195 balls in 21 games this season = 9.3 balls per game. Great entry! Too bad Mateo didn’t manage more, but like you say, sometimes that’s just the way it goes. I hope it was fun for everyone, despite relatively few balls by your standards. That grass-stained one is ridiculous! Nice entry Zack. I like the grass stain. Are you going to be following A-rod at all on the Yankees road trip to catch 600? 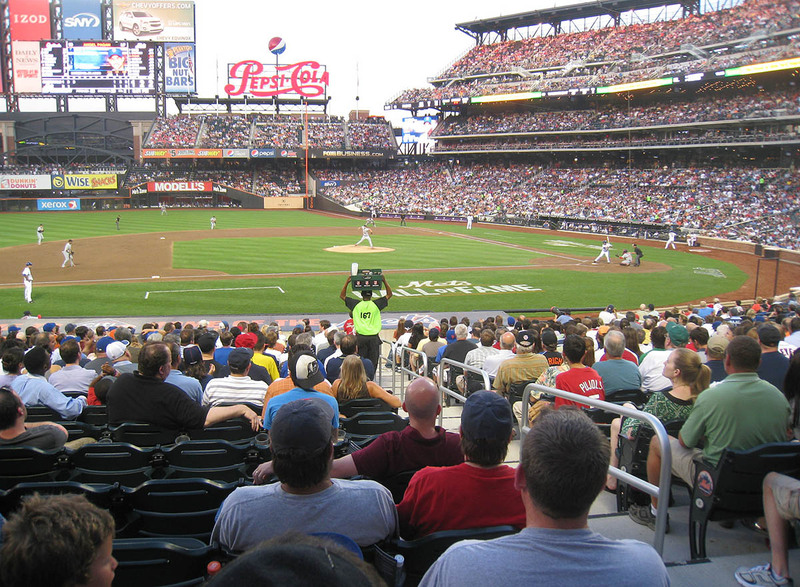 I have made preliminary plans to go see the mets play the phillies next friday in philly. 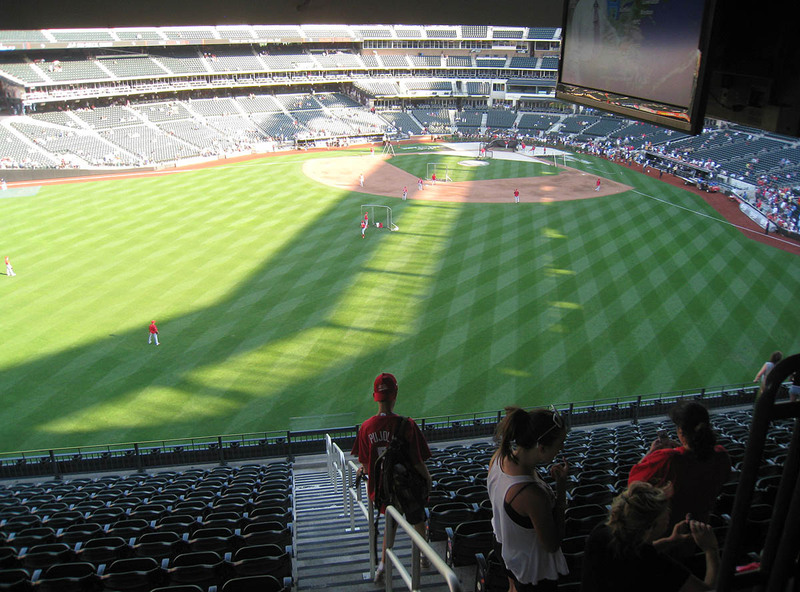 After looking at your blog entry from the world series last year and the seating chart, I figured out that the umpires exit at the home plate end of the visitors dugout. My question is that since you only have access if you’re in the diamond club, how did you manage to get down there to get an ump ball after the game? Much fun was definitely had. I had no idea that the grass-stained ball would be so popular. Anyway, I’d say there’s about a one percent chance that I’ll fly down to Tampa if A-Rod rolls in at 599. I still have way too much stuff going on in NYC to take off for a few days, but if A-Rod comes back to NYC at 599…watch out. You don’t need to be in the Diamond Club. The corner spot in the regular seats will get you close enough. Again Zack, you are a true class act for teaching other people on how to get balls. You’re a great role model. I noticed you were wearing your San Jaun Series shirt, its a badass shirt haha. ahem..i finished bp with 4 balls..
haha..but good night, good to see everyone.. Thanks so much, although I don’t think I can take credit for being generous with my advice when I’m getting paid for it. That said, I do help people quite often who don’t pay me. You have no idea how many emails I get (and answer) on a daily basis from folks who want advice. You had four at the end of BP? Or by the end of the night? If you had that many after BP, then…I’m terribly sorry. hope to see you soon at a game again..
thats really great you raised over $1,000 for charity so far! 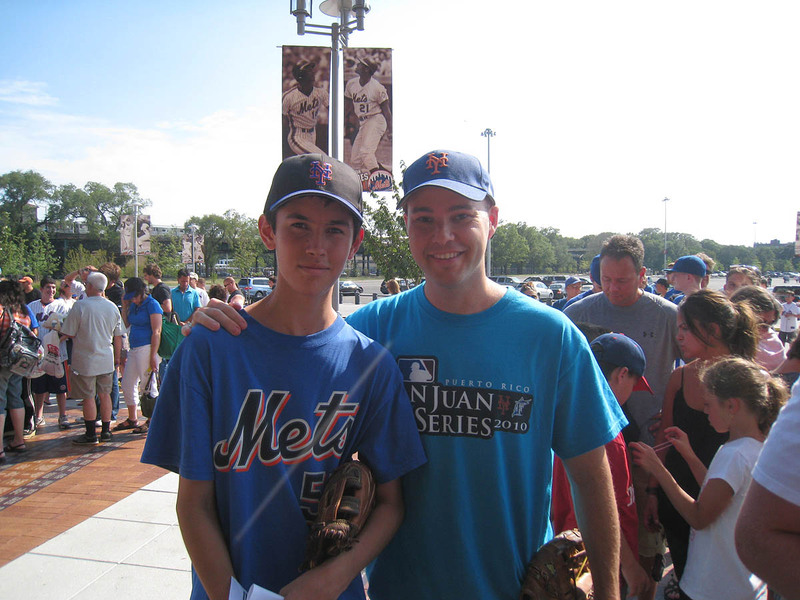 i am going to citi field in a few weeks did any of the players sign any autographs at the game? And if so where? Thanks! 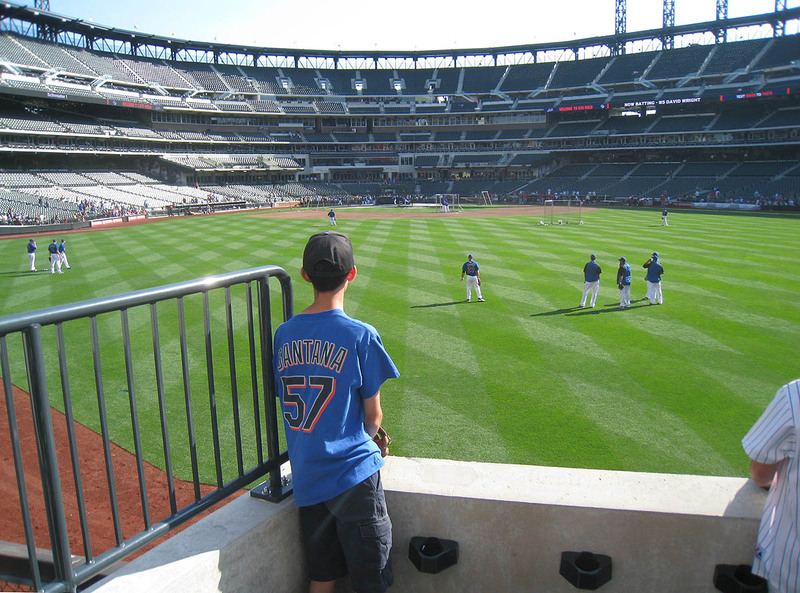 Hey Zack, I was wondering if your going to be at Citi Field On August 15 vs. The Phillies. If you are, I would love to say hito you and im also planning on using your cool glove trick. Ive tested it a couple of times and its working great. I got the hang of it so far and looking foward on using it during batting practice. Hope I see you there. Whoops. Sorry. Thanks for setting the record straight. I think a few of the Cardinals signed at the dugout right after BP. It’s hard to get down there, though. It helps to have a ticket for that section. P.s: I hope you’ll read my entry when ever you’re free.